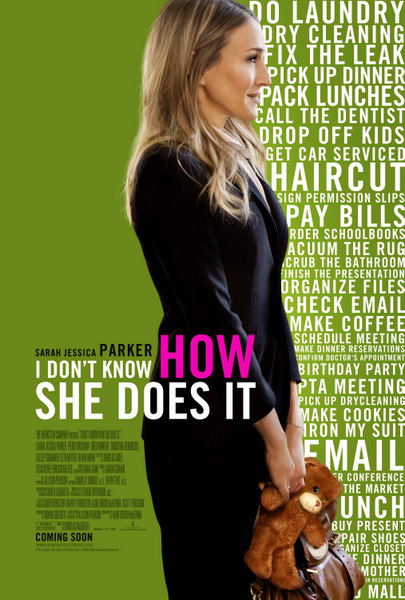 Here is the final one-sheet from Weinstein Company upcoming film I DON’T KNOW HOW SHE DOES IT. The film is directed by Douglas McGrath, starring Sarah Jessica Parker, Greg Kinnear, Pierce Brosnan, Olivia Munn, Seth Meyers, Kelsey Grammer, Christina Hendricks and Jane Curtin. I DON’T KNOW HOW SHE DOES IT opens in theaters September 16, 2011. Sarah Jessica Parker, Greg Kinnear, Pierce Brosnan, Olivia Munn, and Christina Hendricks star in I Don’t Know How She Does It, a comedy from director Douglas McGrath (Emma, Infamous) and producer Donna Gigliotti (The Reader, Let Me In). Based on the critically acclaimed bestseller by Allison Pearson, I Don’t Know How She Does It follows a Boston-based working mother trying desperately to juggle marriage, children, and a high-stress job. Kate Reddy (Parker) devotes her days to her job with a Boston-based financial management firm. At night she goes home to her adoring, recently-downsized architect husband Richard (Kinnear) and their two young children. It’s a non-stop balancing act, the same one that Kate’s acerbic best friend and fellow working mother Allison (Christina Hendricks) performs on a daily basis, and that Kate’s super-brainy, child-phobic young junior associate Momo (Olivia Munn) fully intends to avoid. When Kate gets handed a major new account that will require frequent trips to New York, Richard also wins the new job he’s been hoping for—and both will be spreading themselves even thinner. Complicating matters is Kate’s charming new business associate Jack Abelhammer (Brosnan), who begins to prove an unexpected source of temptation. 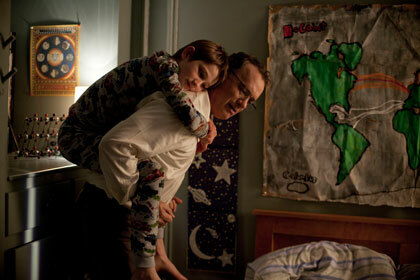 Here is the new trailer from Weinstein Company upcoming film I DON’T KNOW HOW SHE DOES IT. The comedy is directed by Douglas McGrath, starring Sarah Jessica Parker, Greg Kinnear, Pierce Brosnan, Olivia Munn, Seth Meyers, Kelsey Grammer, Christina Hendricks, Jane Curtin. I DON’T KNOW HOW SHE DOES IT hits theaters on September 16, 2011.